Cisco Systems (CSCO) will report their fiscal Q2 results after the close. The options market is implying about a 4.4% move tomorrow, which is basically in line with the average one-day post-earnings move over the last four quarters, but below the 5.4% average over the last ten years. With the stock at $47.40, the Feb 15th 47.50 straddle (the put premium + the call premium) is offered at about $2.10, or about 4.4%, if you bought that, and thus the implied movement you would need a rally above $49.60, or a decline below $45.40 to make money by Friday’s close. Shares of CSCO trade at nearly 16x expected FY 2019 eps growth of 17%, a meaningful acceleration from last year’s 9% growth, with sales only expected to grow 5% vs FY 2018’s 3% growth. 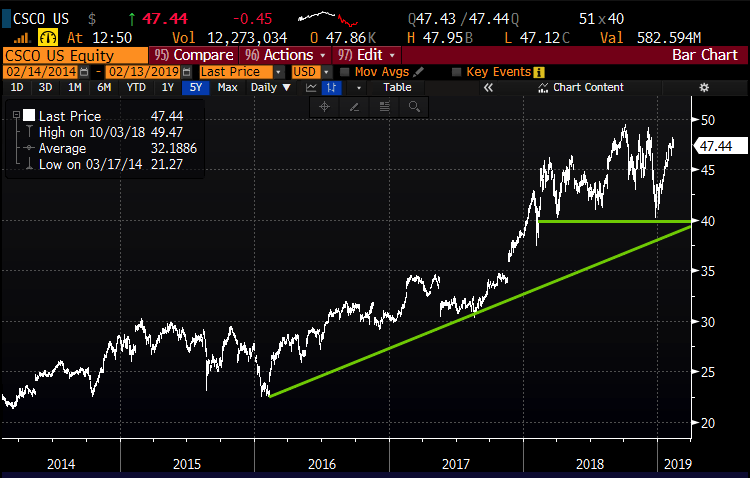 Given the uncertainty regarding trade with China, our growing dispute with Chinese telecom equipment provider Huawei (and CSCO rival), CSCO’s more than 40% revenue exposure outside the U.S. with a very firm U.S. dollar, I am hard-pressed to see the company’s ability to offer guidance that could cause the stock to meaningfully breakout above the 2018 highs just below $50. I agree with this, coupled with the stock trading very near a market multiple. My Take into the print: with the implied move of about 4.5%, for those looking to make a defined risk directional bet, to buy an at the money put or call, you would be risking about $1 for a two-day trade in the weeklies or about 2.2%. If you got the direction right I suspect this should not be a high hurdle. But I think you have a scenario where there is about a 1 up 2 down risk reward. If the company were to miss and guide down then you have a stock trading down 5 to 10% depending on the magnitude of the guide. This has a lot to do with the fact that the stock has run 17% in six weeks, and is not far from the prior highs where it is likely to find some sellers. On the flip side, it would take a very unexpected beat and raise to get the stock to breakout to new 19 year highs. With the stock’s recent rally, it is fair to say that expectations are not low, and a mild beat and raise is not likely enough for new highs. Rationale: the options market is suggesting there is about a 35% chance of break-even on this trade in a month, and about a 13% chance that the put spread is at full value on March expiration. 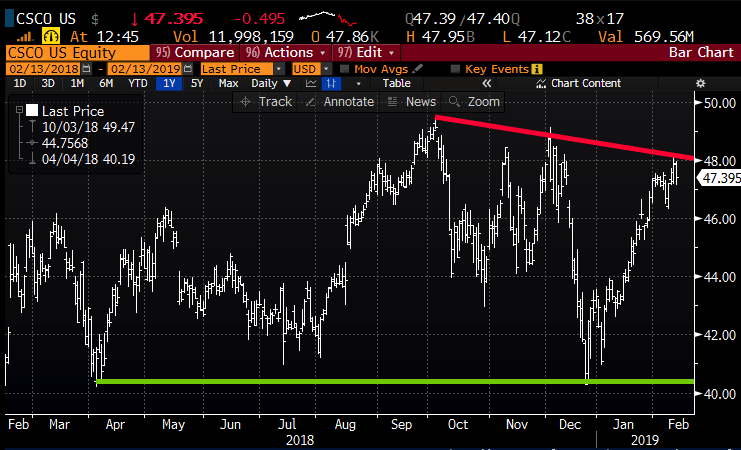 Break-even on Feb expiration: the ideal scenario for this trade idea is that on Friday’s close the stock is at or just below 50 and the short Feb 50 calls will expire worthless or covered for a penny or two. In that scenario, the long April 50 call will have gained in deltas, with that and the short Feb call offsetting decay from the event. At this point, you would own a near the money call for 55 cents that expires in two months.